I have the coolest sisters. I’m amazed by how much they support me. Another great example of this happened on Halloween. I like to dress up, but none of the adults in my family dress up anymore. Since we were trick-or-treating far from home at my parent’s house, my sister Malinda, who lives in the same town, decided to locate a last minute costume. I guess she didn’t want me to be the only adult in our party wearing one. 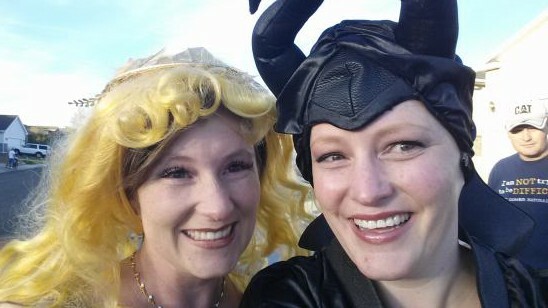 She even managed to find the matching Aurora costume to the Maleficent one I was wearing—my very own “beasty.” What a great night!